Get an angel look in this Hand Embroidered Trendy Barmeri Kauri and mirror work Shoulder Bag enhance with handmade embroidery , Just ideal for carrying those necessary belongings. Made of pre shrunk cotton with Size - 15 inches X 12 inches.Guaranteed fast & vibrant colours. We are manufacturer and exporter of evening party clutches. We also make fashion hand bags as well. This party clutch is made by our trained skilled crafts person. 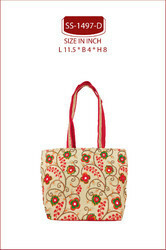 fine embroidery medium sized bags with leather handle. Ethnic handbags made from intricate and heavy embroidered handmade Banjara patches. Handles are made out of faux leather. Side snaps can be opened and bag can be extended to convert to a travel bag also. Antic embroidery Shoulder Bag with multi Pockets. a. 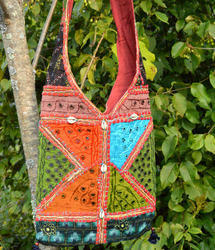 One trendy hand embroidered and sindhi mirror work shoulder bag. Just ideal for carrying those necessary belongings. guaranteed fast & vibrant colours.